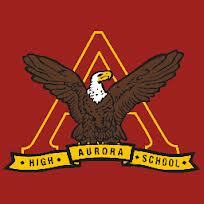 Welcome to the official website of Aurora High School. Aurora High School is one of five high schools in Aurora, Ontario, and is one of two under the jurisdiction of the York Region District School Board. It serves students from Grades 9 to 12. Aurora High School has a strong French immersion program, and serves as the feeder school for many local French immersion public schools. The original Aurora High School, now Wells Street Public School, was on built on Wells Street in 1888. The second building, which became D G.W. Williams Secondary School in 1962, was built in 1952 on Dunning Avenue. The current school building was constructed in 1972. School colours and mascotThe school colours are red and gold, and the mascot is an eagle. The original mascot of the school was the Golden Gopher but the gopher was buried in the back field and replaced by the eagle in June 1985. Former prime minister Paul Martin visited the school on November 9, 2005, to talk about various topics, including Iraq, Afghanistan, and politics. Singer-songwriter Chantal Kreviazuk visited Aurora High in January 2000. She sang the song "Leaving on a Jet Plane" with Aurora band the Amazing Circus Midgets and spoke about her career. John-Michael Scapin, winner of CBC's Triple Sensation, attended this school. Christine Horne attended this school. In 2005, The Senior Boys Cross Country Team won the gold medal in the OFSAA Championships. This capped an impressive career for the squad which included winning the YRAA gold medals three years running (2003–2005), the most decorated and successful single team in any sport in the recent history of the school. In 2009, 2010, and 2011, the Varsity Women's Ice Hockey team qualified for OFSAA. In 2012, the Robotics club won second place in the 2012 Robofest World championship in the Senior Exhibition division. The school has a very strong and influential Student Council, reelected each year by the student body. In addition to these ensembles, the music department also has a Music Council, in which students and teachers plan for music-related events that the department has to offer.